Toronto firm Williamson Williamson has completed a multigenerational home in the town of Ancaster, designed to allow ageing parents to live with their adult children. 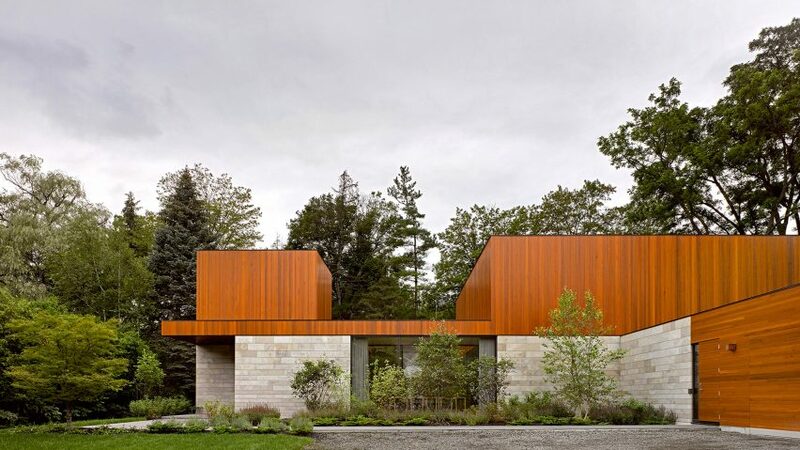 The home takes its name from a nearby stream it overlooks, Ancaster Creek, in Ontario. 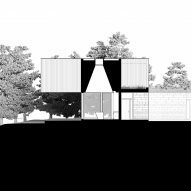 It is the firm's third project that addresses the design challenge of creating a home for ageing residents and their families. 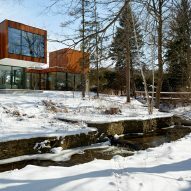 "The House on Ancaster Creek is an example of owner-driven development, creating a unique solution to the complex issue of ageing-in-place," said Williamson Williamson. 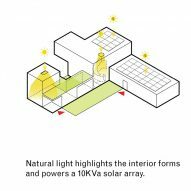 "The project constructs a scenario for living that allows for autonomy while mutually benefiting from proximity," the studio said. 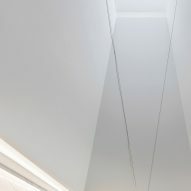 An L-shaped configuration organises the ground-floor spaces. One bar accommodates the grandparents suite, containing a kitchenette with its own seating area, a bedroom, and a private bathroom. Off to the side, there is an additional bedroom intended to be used by guests, or a live-in caretaker, depending on the family's needs. "As the family changes so can the family home," said Williamson Williamson. The perpendicular volume faces towards the creek. 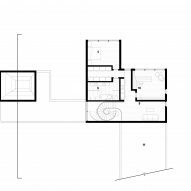 On the ground level, it contains the kitchen, living and dining rooms. These spaces are organised around a sheltered courtyard that contains a small tree. 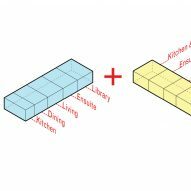 Locating the main social spaces at the intersection of the two volumes allows them to be shared by both generations. The dining room is located between two glazed walls, and sets the kitchen apart from the rest of the home. 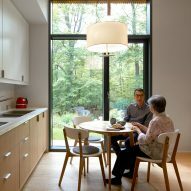 "The kitchen anchors the south end of the house," said the architects. 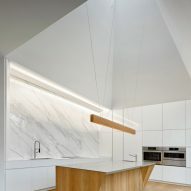 "Set in a double-height volume, the 20-foot-tall pyramidal ceiling creates an expansive space that opens to the creek, the courtyard, and above to the sky." 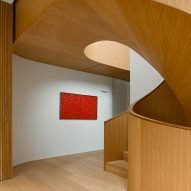 A sinuous wooden staircase leads upstairs to the younger homeowners' quarters. 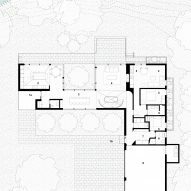 On this level, there is the master suite, a separate office, and a smaller living room that allows the residents to peer into the kitchen below. 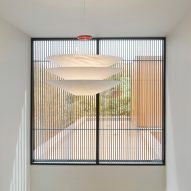 Minimalist finishes and angular geometries inside and out define the contemporary aesthetic of the residence. 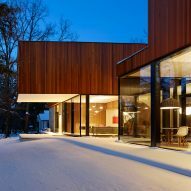 "The living room, with a honed travertine fireplace and oak wall rendered in the form of the exterior cladding, extends under the cantilever in the summer months, doubling in size," said the architects. 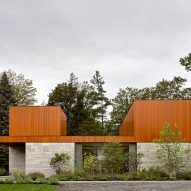 The exterior is clad in wood and stone, aligning with the material palette predominantly found in the area. Another family that created accommodation for elderly relatives they wanted to be close by did so by converting the garage of their home in Rhode Island into an annex. Photography is by Ben Rahn unless otherwise indicated.